The campsite and caravan park at Wells, with hundreds of mobile homes, wouldn’t have been my first choice for a stop, but as such places go, it wasn’t bad. There were plenty of trees to break up the rows of caravans and the showers and laundry facilities were good. Yet again, there was a strong wind forecast but Jon (a friend from Southampton) was coming to visit – accompanied by his mum, who lives in Norfolk near Kings Lynn. We drove into the port of Wells and ate lunch on the Albatross which was the last sail-driven cargo ship on the North Sea, unloading a cargo of soya beans at Wells as late as 1996. Whilst eating Dutch crêpes we looked out to sea at a line of breakers, white in the sunshine, over two miles away at the Wells channel entrance. Jon’s father had supervised the loading of the Albatross with Norfolk malting barley bound for the production of Guinness and Jon’s mother had many stories of Norfolk during the war and of the great flood of 1953, when a huge area of Norfolk was inundated by the sea when a storm surge on top of an exceptionally high spring tide breached the flood defences. Jon explained how this area, before the draining of the fens, had much more in common with Holland (which was more accessible than most of England). Several large brick buildings with Dutch gable ends can be seen in Wells. It also seemed to me that there was a distinct, island-like and individual approach to doing things (sometimes referred to NFN or Normal for Norfolk). Shops still close for lunch and the general approach to life is much more relaxed. I later heard visitors to the area referred to a ‘inlanders’. By the next day, Thursday, the wind had eased making it possible to sail on to Hunstanton, which would be a good location to later set off across the Wash. After packing up the tent and loading everything into the boat, a camping neighbour kindly helped me pull Stacey the half mile to the sea and I made ready to sail. The harbour master asked if I’d rather leave in the afternoon, when the tide would be more in my favour and the wind strength a bit less, but I was keen to get going, so assured him I’d be well reefed and would stay close to the shore (finding some protection from the fresh southerly wind). 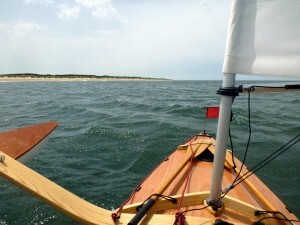 I set off just after noon, and although the wind was strong and gusty, staying close to the shore helped avoid the worst of the east-going tide and meant there was plenty to look at as I sailed past wide and larely deserted sandy beaches, sand dunes and the occasional small inlet. Several black or dark violet butterflies flew across my bows from right to left, heading upwind towards the shore. I was surprised to see how they were able to fly upwind against a gusty 15 to 20 knot breeze and wondered if they’d flown from the other side of the Wash. Ocassional walkers on the shore looked seaward as I passed. Three hours passed this way before I rounded the corner at Gore Point and started to beat southward to Hunstanton. The wind freshened as I passed Hunstanton’s striped cliffs (made up of a layer of green-sand followed by red chalk and topped off with white chalk). After another hour or so I was ashore, helped by Jon who’d come to see me before heading back home to Southampton. Hunstanton Sailing Club had kindly offered me a place to store my boat but there were no camping options nearby, so with Greg’s help we found a nearby B&B and transferred my bags from the boat. The weather forecast for the next few days was for yet more strong winds but Katherine would be coming to see me for the weekend. Before we went our separate ways Jon, his Mum, Greg, Eleri (Greg’s daughter) and I sat in a local café drinking tea and gazing out over the grey wave-stewn expanse of the Wash. The weather was poor but I was very glad of all the continuing help received from friends and strangers.